"Bummel: a wander, a stroll – a meandering journey where the pleasure lies in the travelling, not in the arriving." A leisure activity much practised in former times; the more complicated the schedule the better! 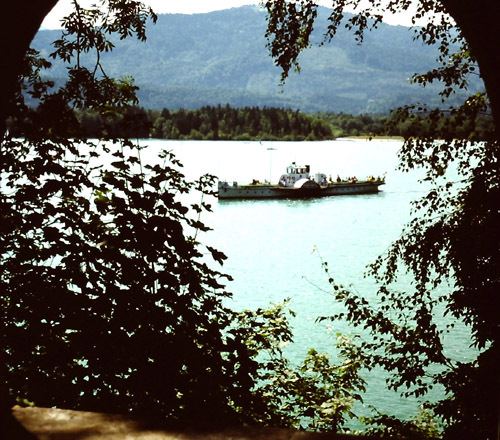 We will travel through the Salzkammergut, by making a 1-day excursion from Salzburg to the top of the Schafberg utilising the 760mm Salzkammergut Lokalbahn. 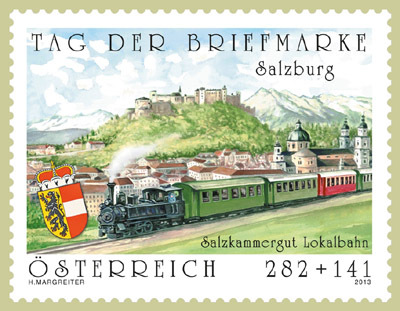 The Salzburg-Mondsee stretch opened in July 1891, soon followed by the Bad Ischl-Strobl part. Both replaced tedious horse-wagon journeys, and were connected by steamboat and coach until the central part was ready. This railway was heavily used by tourists, and its links with the lake steamers and the Schafberg rack railway made complex journeys easy. 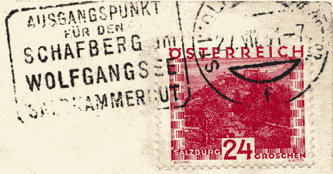 Indeed, it was such an integral part of the region, and so highly liked by the inhabitants, that it had its own song! The chorus is "Zwischen Salzburg und Bad Ischl / pfeift a liebe kleine Eisenbahn / raucht ein bißl, pfaucht ein bißl / und dann taucht sie wieder an…" which roughly translated is: "Between Salzburg & Bad Ischl / puffs a dear little train / a bit of smoke, a hiss of steam / then it disappears again…"
Meanwhile, our train awaits! 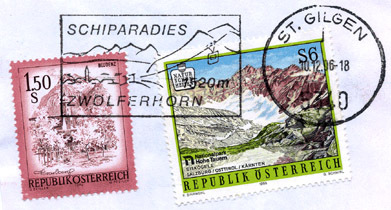 Using the 1910 timetables and Baedeker’s Eastern Alps, I have devised the following easy excursion; naturally I purchased tickets for the complete journey yesterday. All aboard! 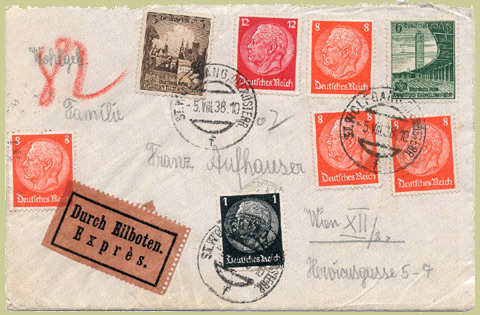 Before we depart we’ll send a holiday letter to a friend in Innsbruck, send a parcel, and deal with assorted mail. Right, off we go: past the church of Maria-Plain and steadily up the wooded hill past Thalgau where we first see the mountains we hope to ascend. Onwards through forests and tunnels we steam, eventually reaching St Gilgen which lies between the Zwolferhorn and the lake of Abersee, or Wolfgangsee as it is now called. We shall return here later, but for now we remain on the train as it runs through meadows and alongside the lake – obeying the stern admonition not to pick flowers while the train is in motion. 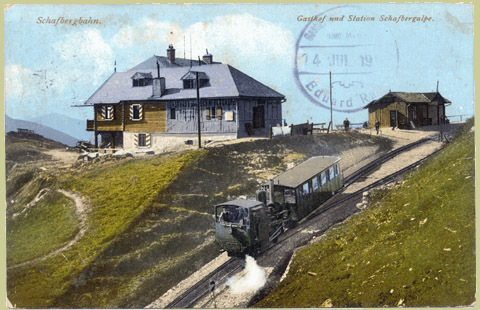 We trundle past Gasthof Lueg and eventually arrive at St Wolfgang Station which we see here in its modern reincarnation. 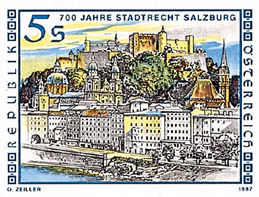 We post a card to a lady we met in Salzburg, handing it to the staff in the refreshment room as we drink a coffee before the boat leaves to cross the lake. We watch them cancel it before they put it in a bag to hand to the TPO-official on the next train. 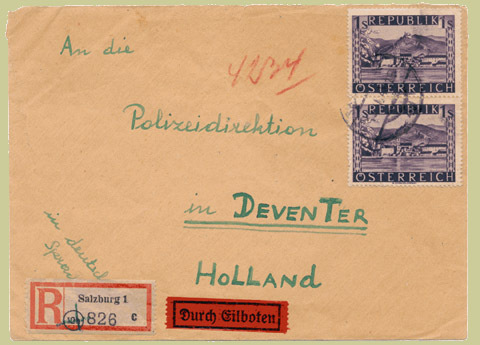 Here is how our letter arrived. 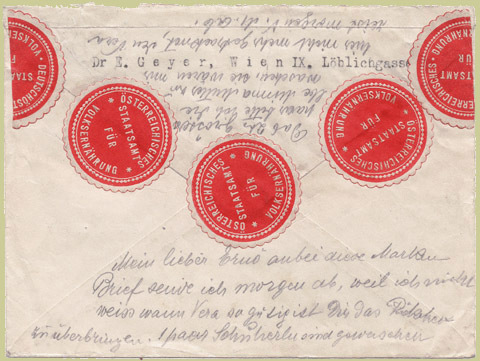 They also have an intriguing letter awaiting delivery to a nearby house, which they tell us is from an important civil servant who has sent his family here while he works all day and every weekend in the Ministry of Nutrition in Vienna. 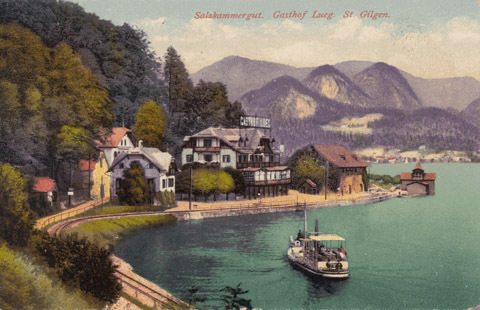 Our steamer casts off and crosses the greenish-blue waters of the lake, calling at the St Wolfgang town pier before arriving at the grandly-named St Wolfgang Zahnradbahnhof. It’s actually a wooden pier and a shed! Disembarking rapidly, we claim our reserved seats on the awaiting carriage. The engine is hissing gently, and soon with a hoot it sets off. We wonder why its boiler slopes downwards, but soon realise that for most of the journey the line climbs steeply and the boiler becomes horizontal. The views are superb, and as the train leaves the woods and climbs the higher slopes of the mountain we can see further and further. The constant vibration as the pinion engages the rack is reassuring! After an hour's steady chugging we arrive at the Schafbergspitze terminus, 1780m above sea level, where we have ample time to admire the view (luckily there is no cloud) as well as have a second breakfast and read the leaflets we were given on the train. Perhaps some other time we’ll "stay overnight, and marvel at the distant sunrise". Meanwhile we post a card at the summit hotel. "One can reach the summit of the Schafberg on foot or with the rack railway, which is in service from 1 May to 26 October. In the peak season trains run hourly from 8:25. "The rack railway, built by Stern & Hafferl, began service in 1893 with steam engines; today there are also diesels. Parts of the route have gradients over 25% (1 in 4) and even sitting in the carriages feels quite adventurous. However if you are comfortable with the rack railway but would like something different, you can alight at the intermediate station and continue on foot. The direct line to the summit is not particularly beautiful, but given some Alpine experience and paying due attention to your safety, you can take the very beautiful Purtschellerweg past three small, beautiful lakes before arriving at the summit. The Schafbergalpe is also good for walking; the view from here is very impressive and the alpine pastures along with their huts are very beautiful. 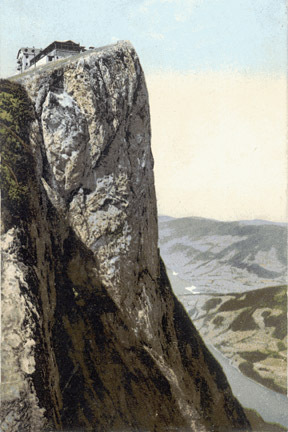 The summit of the Schafberg offers a really impressive prospect, although the other side falls steeply and children must be safeguarded. 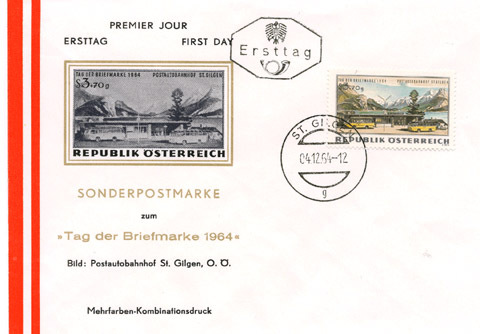 One should not miss going up to the cross on the summit at the Himmelspforte, as from there one has a first-class view over Mondsee." 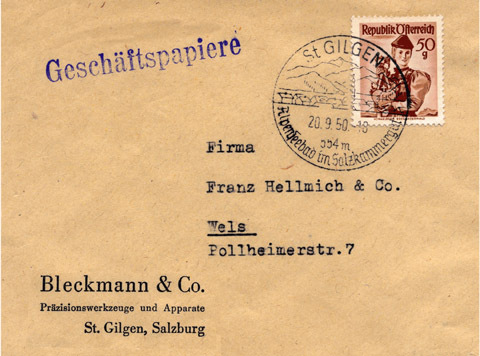 Some philatelists are also very interested in railways, and if you are one then this alternative approach to the Schafbergbahn may be of interest. 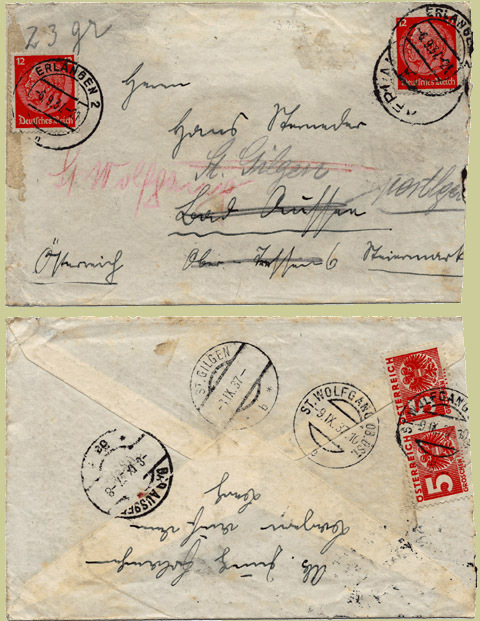 Opened 13 June 1895 as a seasonal Postablage; also a Telegraph station. 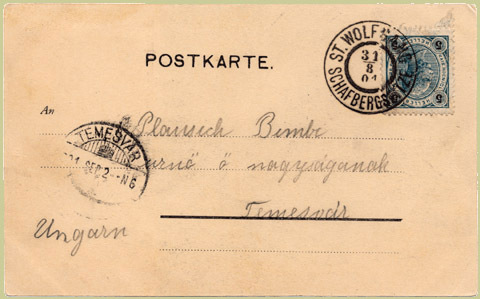 (Never a Post Office.) 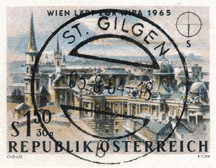 Closed 1921. 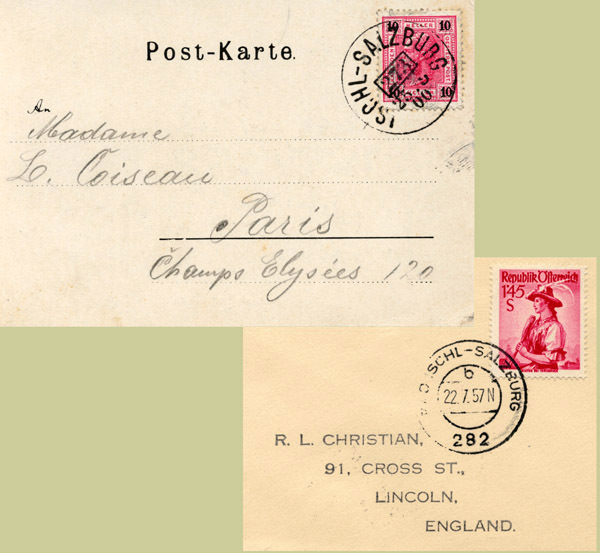 Double circle, sanserif text, 3-row date dd / mm / yy, known 1900-1911. 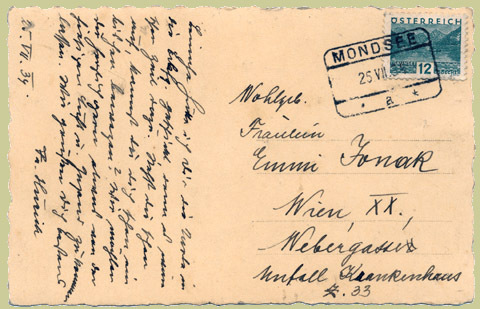 Found later, with no date, in violet, as sender's cachet. 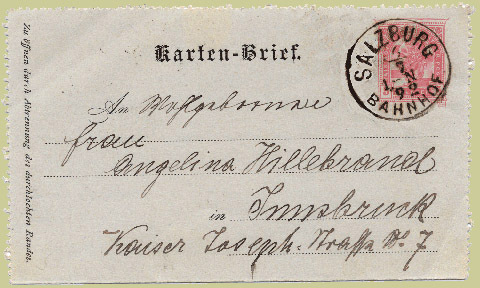 Ring cancel with straight-line date dd mm yy; month in roman numbers. 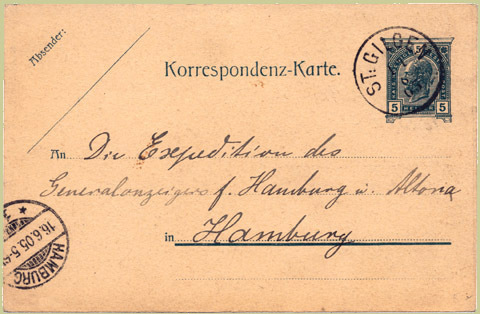 Found 1912-1914. We also have time for a stroll around the summit, looking with predictably total lack of success for the gentians and edelweiss which, the brochures assure us, "grow freely all over the beautiful countryside". Noon comes – and our train is ready to start the descent: time to say "Auf Wiedersehen" to Mr Eightroads. 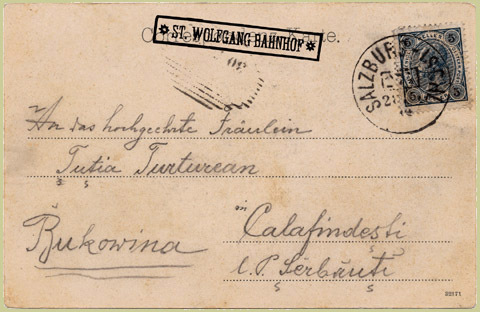 The construction of the train, we read, brought to an end the 19th century profession of "armchair carrier", a lowly but highly remunerative occupation for over 30 of the working class in St Wolfgang. 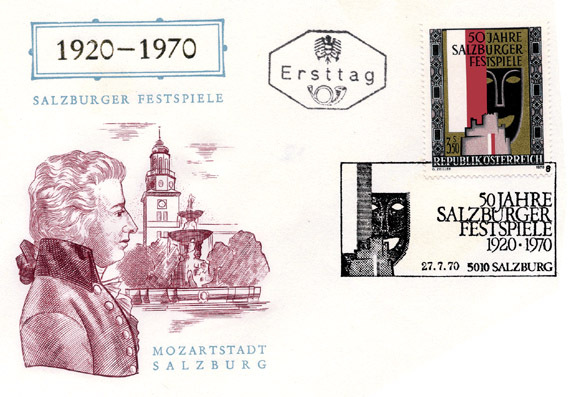 The Viennese aristocracy, and also the middle classes, "discovered the open air"; this was encouraged by the Emperor as it kept their minds off politics! 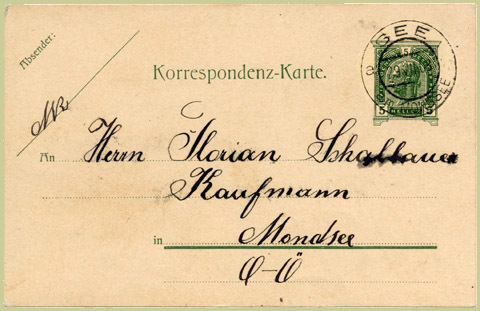 There was a professional association for the carriers, with fixed tariffs (14 Gulden in 1888 for a chair with 4 carriers), and rules for the security of the persons they carried. 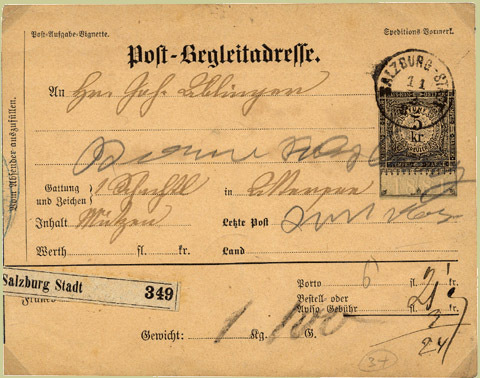 At a "Standquartier", orders were received and notes kept of who was with whom and where on the way; to assist with this a telephone line was built to the Schafberg summit. Arriving back at the lakeside, we walk to the town of St Wolfgang, and first visit the church to see the famous altar polyptych, carved in wood by the Sudtiroler Michael Pacher and completed in 1481 after 10 years work. 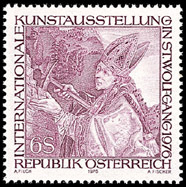 The first church was founded by Wolfgang, Bishop of Regensburg, in 790 AD. The present building was erected by the Benedictine monastery at Mondsee in 1477, and contains many other famous works of religious art. 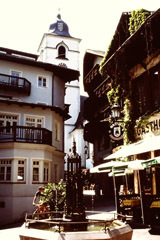 We stroll through the town, admiring the picturesque buildings. 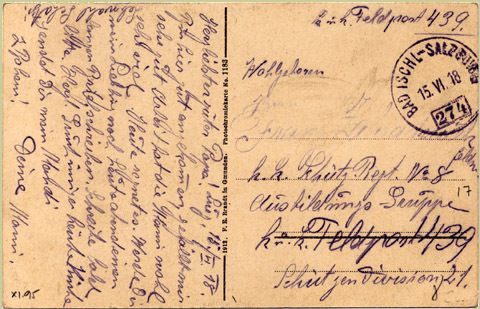 In a small shop we find a few envelopes with interesting cancels. 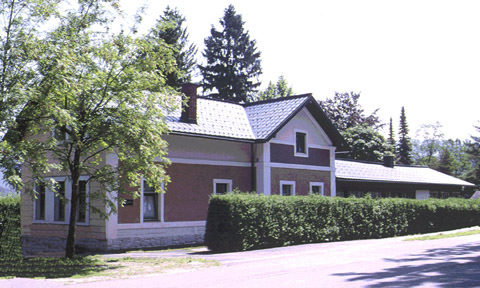 The Hotel Weisses Rössl is famous for its lakeside location - and for its cakes! 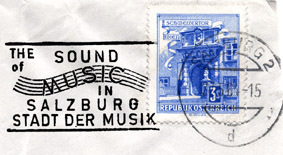 It is also famous for the Singspiel "Im Weißen Rößl" first performed at Großes Schauspielhaus in Berlin on November 8, 1930, composed by Ralph Benatzky. 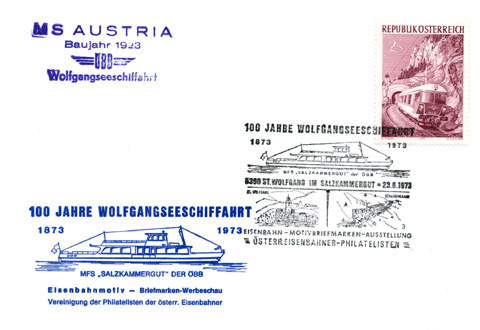 The songs 'Im Weißen Rößl am Wolfgangsee' and 'Im Salzkammergut, da kann ma gut lustig sein' have become world-famous. 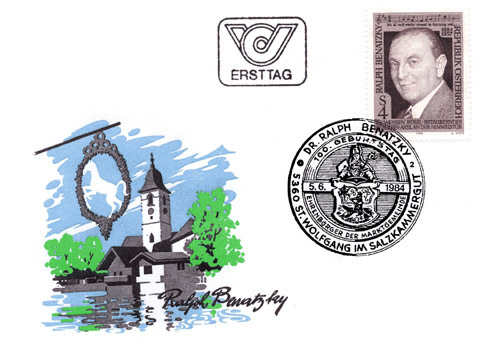 The composer was born as Rudolf Josef Franz Benatzky at Mährisch-Budwitz on June 5, 1884, and died in Zurich on October 16, 1957. 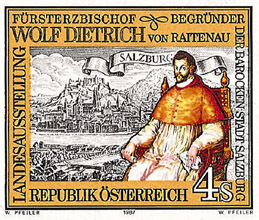 St Wolfgang made him an honorary citizen. 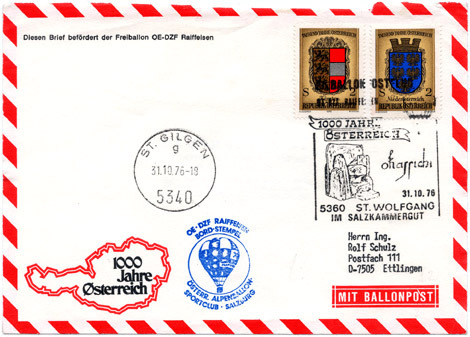 Other people’s outgoing mail seems to have been more urgent than ours! Next to the hotel is the steamer pier, where we catch the boat for St Gilgen on the next stage of our Bummel. Or indeed an aeroplane - as our steamer arrives, we can see some of the activity of the Flugwoche St. Wolfgang. We pass the inscription honouring the German poet Joseph Victor von Scheffel (1826 - 1886) carved in red letters a yard high on the sheer face of the Falkenstein. 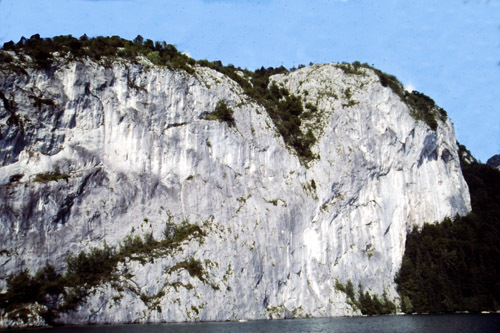 This rock offers a 28-m cliff diving site, for those considerably more adventurous than us! We pass two memorial crosses, before pausing at the Gasthof Fürberg. 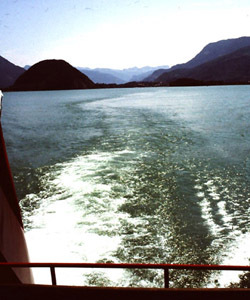 Nobly resisting the fame of its baked trout, we stay on board and reach St Gilgen, where we have more items to post and lunch to find. 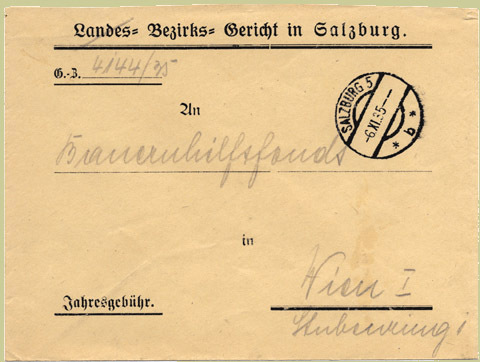 Time permitting we’ll visit the museum, which has a large display of post-WWI "emergency money". 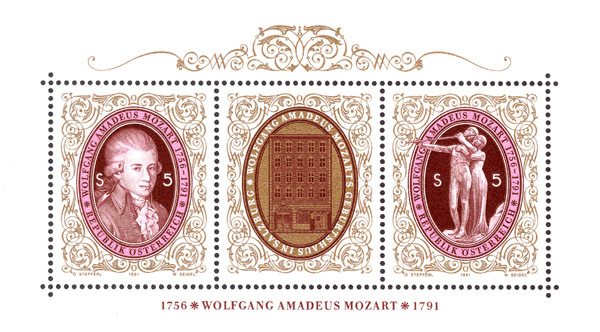 St Gilgen was the birthplace of Mozart’s mother, born Anna Maria Pertl in 1720. 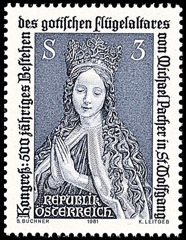 Her father, Wolfgang Nikolaus Pertl, was a successful lawyer, and whilst a student was also a singer both in the Benedictine choir and as a soloist. The church has a distinctive creaking tower (complete with noisy bells) and excellent ceiling frescos. 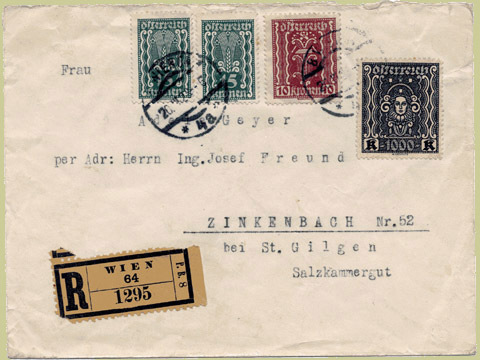 We’re not the only philatelic traveller in this area: this 1937 letter from Erlangen in Germany visited Bad Aussee and St Gilgen before collection at the Poste Restante counter at St Wolfgang. On the lowest slopes of the 1522m high Zwolferhorn above the town we await the mid-afternoon train from Bad Ischl towards Salzburg, on which there is again a TPO. The train takes us back through the woods and tunnels to the side of Mondsee, and we leave it at St Lorenz where we join the single carriage railcar – known locally as the Mondsee cow – which takes us to the town in 10 minutes. The lakeside paths with their view of the Schafberg are well known, as is the twin-towered church, part of the former (748-1791) Benedictine Monastery (fans of Julie Andrews will recognise the steps to the high altar). A rock rising out of the waters of the lake bears two crucifixes, for which no clear reason has yet been found. In 1864, the remains of a lake-dwelling village were found by the outlet from the lake, along with dug-out canoes from the Neolithic Age (the Mondsee Culture). 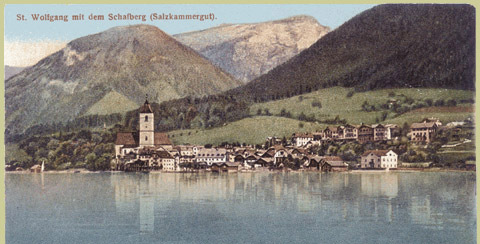 Until 1950 fishermen on Lake Mondsee continued to use canoes cut out of long tree trunks. Milestones and the foundations of villas from the Roman age are a further testimony to the past of this ancient settlement region. Time for a K.u.K. 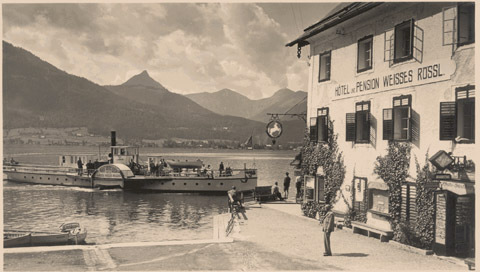 (Kaffe und Kuche), then we catch the Mondsee steamer to Plomberg where we disembark, leaving it to sail down the lake to the village of See at the other end. During the summer, the water temperature is between 20 and 24° C, making it by far the warmest lake in the Salzkammergut – however we aren’t tempted! We have time to walk leisurely from the pier to the nearby station, before we catch the last train of the day back to Salzburg. We arrive at 7:30pm, in good time for a Stiegl and a Salzburger Nockerel as our evening meal. 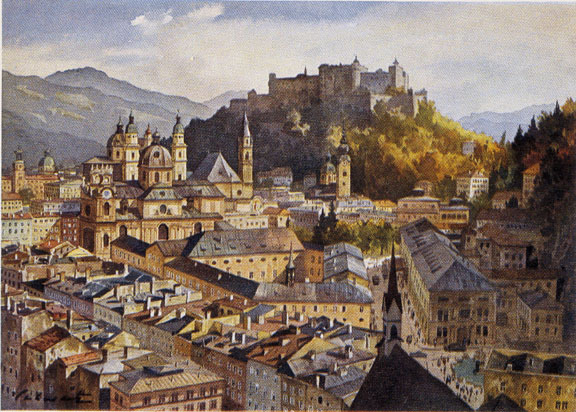 And finally the city of Salzburg, and its second most famous resident.